GUATEMALA CITY (CNS) — Church officials in Guatemala did not comment in the days after a former dictator, Gen. Efrain Rios Montt, was found guilty of genocide and crimes against humanity. 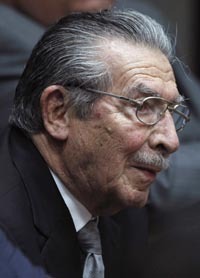 A judge sentenced Rios Montt, 86, to 80 years in prison for crimes carried out in 1982, when he allegedly initiated a policy of extermination of Mayans for their ties to Marxist guerrillas. The ruling was seen as historic in a country known for its impunity. Archbishop Oscar Vian Morales of Guatemala made no reference to the May 10 ruling in his Sunday Mass two days later. He also did not meet with reporters who waited for him for a statement at the end of the celebration, Guatemalan press reported. Neither the Archdiocese of Guatemala homepage nor its Facebook page referred to the sentence against Rios Montt, who on May 13 was taken to a hospital after fainting while being taken from the jail where he remains imprisoned to court to hear details of the sentence. The Guatemalan bishops’ conference also has not issued any statement about the case. Rios Montt became de facto president after leading a coup in March 1982. Another coup brought his government to an abrupt end in August 1983. 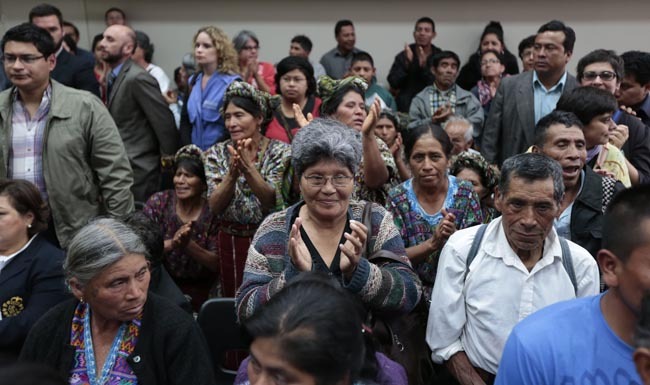 The trial was focused on the murders of more than 1,700 Ixil people. The general’s former intelligence chief, Jose Rodriguez Sanchez, was cleared by the court. Guatemala’s 36 years civil war left an estimated of 200,000 dead and 45,000 missing when it ended in 1996.